PCMS Design was absolutely delighted to win an Award at the 2016 LABC Building Excellence Awards ceremony last Friday evening, which was presented for the ‘Best Partnership with a Local Authority Building Control Team’. This was in recognition of the close links we share with our partnership authority, Central Bedfordshire Council. 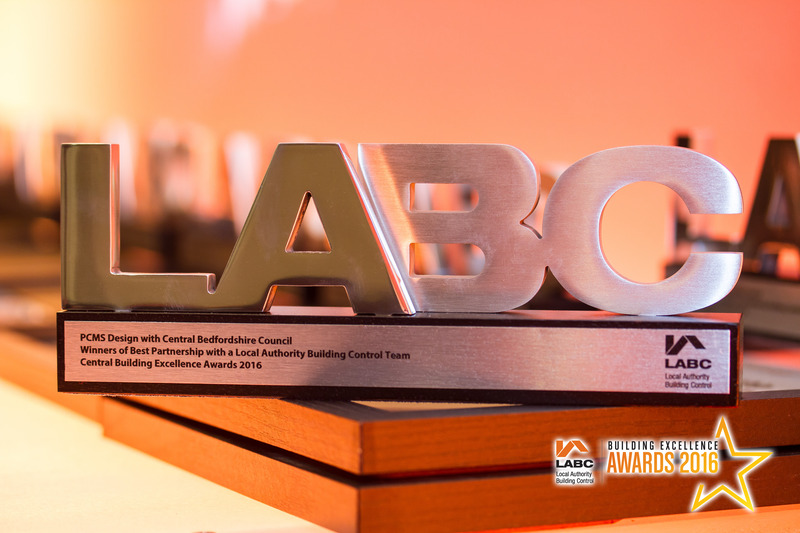 Our team attended the LABC Central region ceremony at Double Tree by Hilton hotel in Milton Keynes, which saw a gathering together of local construction industry leaders, clients and building control departments. The presentations recognise building excellence in the delivery of outstanding construction and workmanship. LABC (Local Authority Building Control) is an organisation which exists to represent all local authority building control teams in England and Wales. 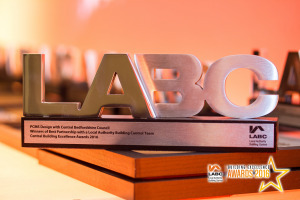 Following the win, the firm has now been invited to attend the National LABC Awards ceremony in London in November, with the opportunity to win the ‘Best Partnership’ category in England and Wales. Peter Keates, Head of Development & Regulation at Central Bedfordshire Council, said: “Congratulations to PCMS Design on your success at the Central Building Excellence Awards in winning the Partnership Category – it was well deserved and we look forward to many more years of our ongoing partnership”. This entry was posted in building control, Building Excellence Awards, LABC on April 25, 2016 by admin. Click on the image for full details of our Job Vacancy. 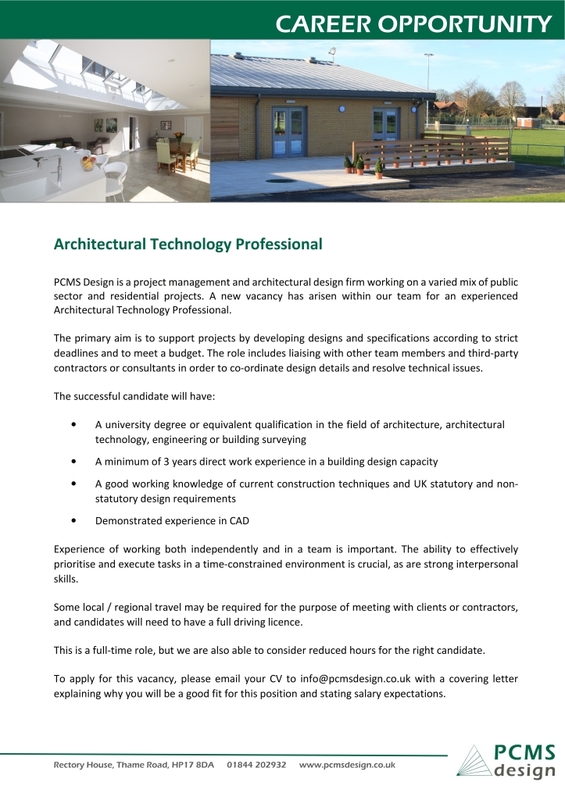 To apply, please send your CV with a covering letter to info@pcmsdesign.co.uk or telephone 01844 202932 for further details. We are very pleased to have secured Householder Planning Permission from Aylesbury Vale District Council for extensive alterations to a bungalow. Based in the rural hamlet of Easington, the dwelling sits in a prominent position with stunning views over the Vale of Aylesbury. Our client had aspirations to substantially improve the internal spaces, and in particular to add a first floor to the dwelling. This will create space for 3 bedrooms, an en-suite and a family bathroom, and allow the ground floor to be reconfigured to create larger and more practical rooms and living spaces. Some of the internal walls will be removed to create a large lounge / hallway area with a new set of stairs leading up to the first floor. 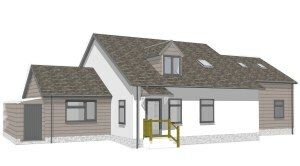 Plans also detail a substantial revamp of the external appearance to include a pale rendered finish on the central section and two timber clad ‘wings’. New dormer windows enhance the attractive design. It is hoped that construction work on the project will start shortly. This entry was posted in Buckinghamshire, design, extension, House Extension, renovation, Residential on April 15, 2016 by admin. In the latest in a series of projects that PCMS Design have been working on for Denbigh High School, we have recently secured planning permission from Luton Borough Council for an extension to the school’s main car park. There is currently a shortage of adequate on-site parking for staff and visitors, and the extension will add a total of 14 new spaces in marked out bays, two of which will be suitable for disabled parking. Landscaping will be done sensitively so as to maintain the appearance of the school’s distinctive frontage. 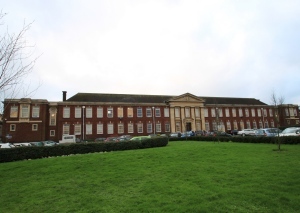 The school management team is looking forward to appointing a contractor to carry out the works over the summer holidays, so that disruption to daily operation will be minimised. This entry was posted in Bedfordshire, car park, construction, Denbigh High School, planning permission on April 13, 2016 by admin. PCMS Design has successfully secured planning permission from Chiltern District Council for a residential client to construct a replacement barn on their property in rural Buckinghamshire. There are a number of outbuildings on the estate, including a couple of rather old timber structures formerly used as stables and storage. The plan is to demolish these outbuildings and replace them with a single timber storage barn and horse shelter, which will be constructed to modern standards and have a much improved appearance when viewed from the residence. The 125m2 pitched roof barn will have a timber frame, white windows and a wide doorway. At 4.5m tall, there will be sufficient head height for circulation and storage. Work to demolish the old stables and construct the replacement barn will begin shortly. This entry was posted in Barn, Barn conversion, Buckinghamshire, construction, design, Residential on April 6, 2016 by admin.